The team that raised the most money for AFSP carried the banner at the head of the pack. Each year, approximately 42,000 people die by suicide. It is the tenth leading cause of death in the U.S. and for every one suicide, there are 25 attempts, according to AFSP.org. 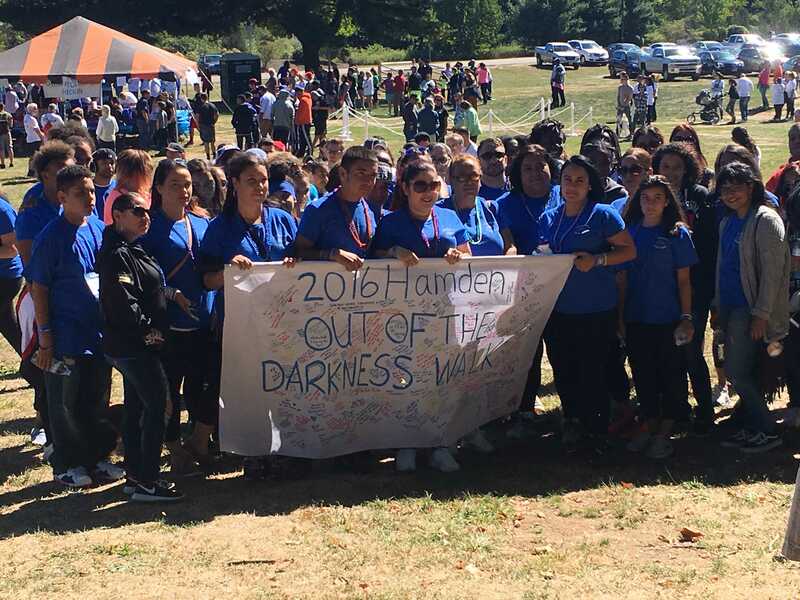 On Sunday, Sept. 25, the Out of the Darkness Suicide Walk was held in Hamden. Hundreds of suicide survivors, parents who have lost their children, friends, daughters or sons and supporters alike joined together in raising money for the American Foundation for Suicide Prevention (AFSP) while walking three miles on the Farmington Canal Trail. The Out of the Darkness Suicide Walk is a nationally recognized event that is put on with the goal of raising money that will help support efforts for suicide prevention. Nationally, the money raised through this walk funds grants for research for developing evidence based practices for suicide prevention. 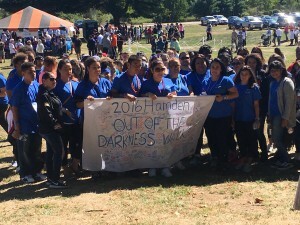 Locally, the AFSP chapter putting on the event in Hamden gets to keep half the money that was raised at the walk. It is used to sponsor trainings for community members to learn gatekeeping skills to recognize signs of suicide and help intervene. 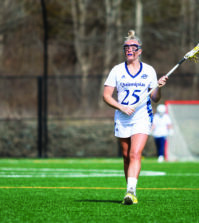 Quinnipiac’s Student Veteran Organization (SVO) has been involved with the suicide walk through Professor Emily McCave, an associate professor of social work at QU. 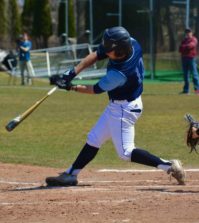 McCave serves as the co-chair of the suicide walk in Hamden and is also the president for the Southern Connecticut chapter of AFSP. Justin LePage, who was the vice president of SVO three years ago, got the group involved with the walk. At the start of the event, participants were asked to collect different colored beads. “They have different colored beads depending on what kind of relationship you have with suicide, whether it’s a loved one, family member, military veteran or if you deal personally with depression,” Jakob Loren, treasurer of SVO, said. Two members of SVO stood on the stage to represent the silver beads, a color that stood for losing a first responder or someone in the military to suicide. The green beads represented personal struggle. 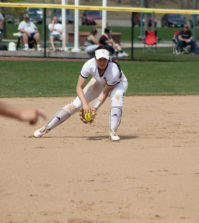 For McCave, her connection to the cause comes from a loss very close to home. She lost her mother to suicide when she was only 3 years old. McCave honors her mother through the work that she does as a social work professor and also with AFSP and the Out of the Darkness walk. McCave said what people do not realize is that we lose just as many people to suicide as we do to breast cancer. She also said mental illnesses should be treated like any physical disease. McCave wants people to understand that suicide does not come from a place of selfishness. Barbara Pomeroy was present at the walk on Sunday. She was a part of “Team Christian,” a group of friends and family of an 18-year-old boy from Cheshire who they lost to suicide. Barbara’s daughter is married to Christian’s father. Pomeroy said Christian just finished school and was ready to start a new job. Unfortunately, on the day he was to start his job, he died by suicide. She believes the help that organizations like AFSP is providing is completely worth it.